Will there be a tribute to Neil Simon next month? I hope so. So sad that he passed away. He was a really great man and he did really great films. We will all really miss him so much. My favorite Neil Simon production was the 1986 National Theatre (London) production of Brighton Beach Memoirs, with Frances de la Tour and Steven Mackintosh. I also love the musical Little Me, for which Simon wrote the book, based on the Patrick Dennis novel. This is sad news, his films are among my favorites, and with the exception of 2 made for tv films, London Suite and Laughter on the 23rd Floor, I've watched them all too many times to count..they are my go-to watches for times I need 'familiar/funny'. I've often thought of the talent pool he started with while writing for Sid Caesar in the 50's--Neil and Danny Simon, Mel Brooks, Carl Reiner, Mel Tolkin, and later Woody Allen and Larry Gelbart --what are the odds of finding so much comedic talent in one place? Yea, that is some talent. As for the odds? I would need to ask Miene "Minnie" Schoenberg. 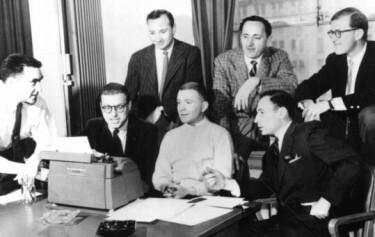 I mentioned this on another forum about Neil Simon, who was one of a number of team writers for Sid Caesar's "Your Show of Shows" which really had the cream of the crop when it came to comedy writers back in the 1950's: most of them, plus Sid and his straight man Carl Reiner, all lived into their 90's. Lucille Kallan I think died in her mid-70's. Carl, and Mel Brooks, are still with us. In fact, Neil's death prompted me to watch some YSOS skits on Youtube this afternoon - hilarious stuff. RIP Neil Simon, thanks for all the laughs. 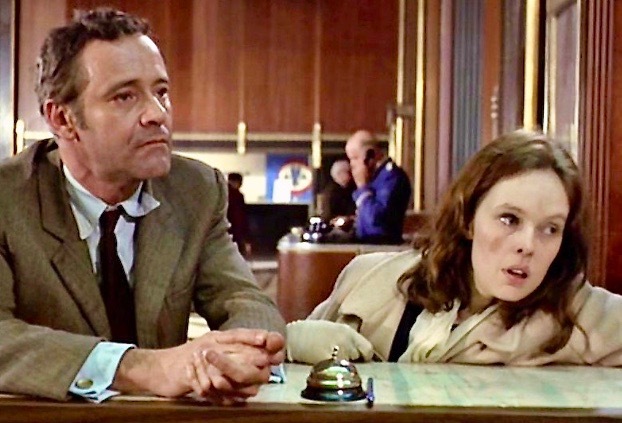 That's my favorite Neil Simon movie too, and the pairing of Jack Lemmon with Sandy Dennis could not have been better, their onscreen chemistry was perfect. Yes, too bad they didn't make a sequel (written by Neil Simon of course). The remake with Steve Martin and Goldie Hawn wasn't half as good. That scene where Lemmon tries to get the woman to get his wife out of the bathroom, and she drags out the wrong woman is one of the 10 funniest scenes in movie history, IMO! I never fail to let out a belly laugh like Santa Claus every time I see it. Will there be a tribute to Neil Simon next month? . Actually, whenever they do a tribute to either JACK LEMMON or WALTER MATTHAU it too, winds up being a tribute to Mr. Simon. Y'know, like others here, there were some Simon works(adapted to film) that I liked better than others, but I can't think of ONE that I really didn't like. And I think in a thread saluting his memory any dislikes shouldn't be mentioned by anyone. "When it's 100 in New York, it's 72 in Los Angeles. When it's 20 in New York, it's 72 in Los Angeles. This is a great line. Truly great. Wildly, epically untrue. But a great line. I've been sitting out the thread because I could think of Simon plays and 70's Simon-boom movies that were droll, but couldn't think of one that I really liked. Just mentioning Simon's plays brings up the memories of 70's old-school Broadway, when straight people went to original musicals and a Neil Simon play could be just as big of an out-of-town tourist draw. Even our idea of a live-audience TV sitcom like "The Odd Couple" comes from the experience of getting a half-hour taste of Neil Simon comedy theater in our living room. The Tony Awards try to keep the drama-play business going by saying that while Musicals throw spectacle at you, Plays put you into the room with the characters. That works well for drama, but when you're in a room with FUNNY characters, that's just as much of a memorable evening. Neil Simon certainly deserves a substantial TCM tribute. His genius was the source of enough good movies to fill a whole day -- or, at least, a full night. I never had the opportunity to see one of his plays on Broadway, but I remember his movies going back to the late 60s or early 70s, when The Odd Couple was first shown on TV. The network repeatedly showed a promo for it that featured the scene of Walter Matthau as Oscar throwing a plate of linguine at the kitchen wall, saying "Now it's garbage." My friends and I just thought that line was hilarious, and I think it inspired most of us to watch the movie itself. We were pre-teens and probably didn't get all of the jokes in the movie, but we loved that line: "Now it's garbage." My admiration for Simon's huge talent only grew from that point. I also loved the TV adaptation of The Odd Couple, although Simon didn't work on it, which led me to seek out his other movies over the years -- Barefoot in the Park, The Out-of-Towners, The Sunshine Boys, Murder By Death, The Cheap Detective, Plaza Suite, California Suite, and later, Brighton Beach Memoirs, Biloxi Blues, and others. I hate to admit walking out on The Goodbye Girl, but back then, I just didn't like the abrasive Richard Dreyfuss and the too-precocious Quinn Cummings (the characters they played, that is). I've started to come around to that movie, though -- when I see it on TCM, I find that I actually enjoy it way more than I did during the first run. I went on to read both of his memoirs, which are very funny and very touching. And I noticed when he was credited for writing the lines that made Sid Caesar and Phil Silvers so funny. It's too bad that comedy doesn't get more respect. To me, the ability to draw laughter from an audience is one of the most impressive talents there is. After all, with a drama, you don't really know whether you're reaching the audience, who might be silently moved or silently bored. But with a comedy, if the audience doesn't laugh, you've failed. Neil Simon, who created both comedy and drama, could be proud of every one of the laughs he got, even from those little kids more than four decades ago howling at "Now it's garbage." Has TCM ever had a tribute to a playwright? I don't recall but if not, I'm fine with the first one being for Simon (especially since, unlike many of his peers (E.g. Tennessee Williams), he passed since TCM was a network). Good question. Simon was obviously a playwright, first and foremost. But he did some great writing directly for the screen (e.g., The Out-of-Towners, Murder by Death). And he wrote the screenplays when his plays were transferred to the screen, which sometimes included significant changes from the plays. For example, Barefoot in the Park and The Odd Couple as plays were each set entirely in a single apartment. But in the movie versions, Simon created new scenes and expanded the settings: in Barefoot, he also put the characters in a horse-drawn carriage, at the Plaza Hotel, in a neighbor's apartment, on the Staten Island Ferry, at an ethnic restaurant, at a grocery store, in Washington Square Park, in a bar, and, finally, on the roof of their apartment building; in The Odd Couple, the characters were shown in a cheap hotel, a bar, a restaurant, a park, a grocery store, Shea Stadium, and riding through the streets in a police car. So whether it's a tribute to a great playwright or a great screenwriter, it fits for Simon and belongs on TCM. Good question. Simon was obviously a playwright, first and foremost. But he did some great writing directly for the screen (e.g., The Out-of-Towners, Murder by Death). And he wrote the screenplays when his plays were transferred to the screen (e.g., Barefoot in the Park, The Odd Couple). And Max Dugan Returns is...pleasant enough if you like Jason Robards and 80's-teen Matthew Broderick. TCM is having a tribute on Friday evening the 14th of September to celebrate the life and career of Neil Simon. It's nice that TCM is recognizing Simon. I wish they were showing a few more of his movies, but at least they didn't relegate him to a single tribute movie at the end of the year. I would like to have seen Biloxi Blues and Brighton Beach Memoirs in the mix. And it's a shame they are preempting a premiere, too. Hopefully those interested in it will get to see it some other time soon. You're referring to THE WILD AFFAIR (1963). The Running Wild theme can easily be rescheduled in November or else in January after the holidays. I told ya! guessed two of 'em didn't I. the odd couple and the goodbye girl. probably very easy for tcm to get a hold of those. I knew they wouldn't knock themselves out for any of the better films like the two I mentioned. I bet the odd couple and the goodbye girl get shown on tcm a helluva lot more times than the out-of-towners and the prisoner of second avenue. THE ODD COUPLE is a Paramount film so that tells me they coughed up a bit of dough to lease it at short notice. It's one of his most well-known stories, and of course, people would expect it to air as part of a Neil Simon tribute. I agree that THE GOODBYE GIRL is shown quite often on TCM, but it was probably selected because of Simon's history with Marsha Mason. LOST IN YONKERS gives us some good late-career Simon to watch. 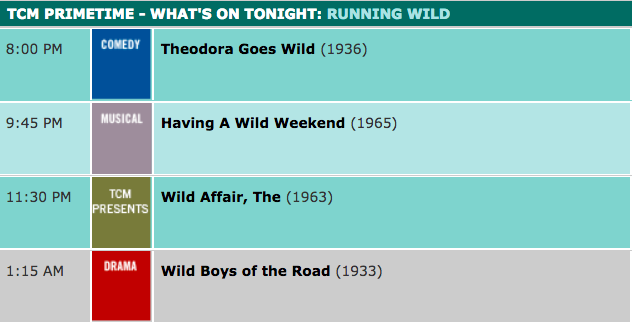 Is The Wild Affair the British film with Terry Thomas in a supporting role? IMDB gives a different year for the release date than TCM, 1965 instead of 1963. Yes. So maybe it's an error in the TCM database. Well, THAT is easily checked, thanks to moviecollectoroh's amazing database! Paramount's The Odd Couple has aired 45 times. The Goodbye Girl has aired 39 times. The Out-of-Towners, also from Paramount, has aired 14 times. And The Prisoner of Second Avenue, despite being from Warner Bros., has only aired 7 times. What about LOST IN YONKERS? It probably hasn't aired too often, since it's a newer film.